The mechanism of injury of the cervical vertebrae is different: most of the time when falling down, when hitting his head on the bottom while diving, with a sharp bend the head forward. 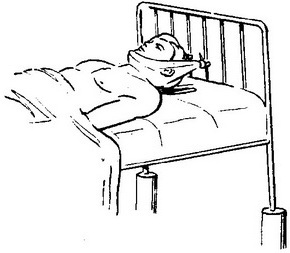 When trauma of the vertebrae in the neck patient is placed on a functional bed or on the bed with wooden shield and hard mattress. The head end of the bed, lifted by 20-60 cm from the floor. Stretching is a loop Glisson (Fig. 19). Therapeutic physical training is assigned to the 2nd day of the injury. The first period is divided into two stages: the first - on the loop Glisson lying on his back; the second in a plaster collar or plaster olukorede (Fig. 20). At the first stage are breathing exercises, elementary exercises for small and medium groups of muscles of the upper and lower extremities, and movement of the lower jaw - wide mouth opening, movement, right, left, forward. All the exercises are done at a slow pace, 4-8 times every movement, with breaks after two exercises. The whole complex is repeated 6-8 times a day. In the loop Glisson not permitted head movements (bends and turns, circular movements) and the dramatic movement of the limbs. Between the 10th and 21st days begins the second phase of the I period. The extension is replaced with plaster collar or plaster polyuretan. The patient is allowed to sit and walk. 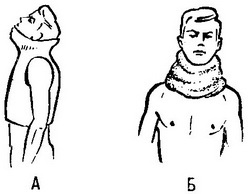 Exercises are performed with full range of motion for the upper and lower extremities, breathing exercises and exercises for the muscles of the neck and shoulder girdle: movement of the lower jaw forward, to the side; the muscles of the neck; the lifting of the shoulder girdle and circular movements in both directions; turns to the side and tilt of the head in different directions. The exercises have to slow or medium (without causing unpleasant or pain and dizziness), 6-10 times each exercise. The whole complex is repeated at 4-6 times a day, I period lasts for 6-8 weeks. In the second period after immobilization assigned exercises for restoration of mobility of the spine in the neck: bends, turns, circular movements of the head. In the 1st week these exercises are performed in a slow and middle tempo, with the minimal amplitude of movements, 4-6 times - each exercise. As the adaptation range of motion, and the number of repetitions of each exercise increase. Included exercises with objects: a stick, batons, rubber and basketball balls, therapeutic swimming. Exercises should not cause unpleasant and painful sensations in the field of fracture. II period lasts 1-1 .5 months. III the period of training. It is recommended to go swimming, boating, outdoor games, skiing, middle tourism. The working ability of the patient restored for 3-6 months. Sports training are appointed by physician individually, but not earlier than 7 months after injury.